The Periphery | Who Wins at Awards Season? The three major entertainment awards — the Oscars, Emmys, and Grammys — flood the media and dictate popular opinion for nearly half the year, every year. To try to understand what these awards mean, The Periphery gathered data from the most recent awards ceremonies, looking at which companies were responsible for distributing the music, movies, and TV shows nominated for awards. Who wins at AWARDS season? The three major entertainment awards — the Oscars, Emmys, and Grammys — flood the media and dictate popular opinion for nearly half the year, every year. They are also surrounded by a good deal of controversy. To try to understand what these awards mean, The Periphery gathered data from the most recent awards ceremonies (the 2015 Grammys and Oscars, and the 2014 Emmys), looking at which companies were responsible for distributing the music, movies, and TV shows nominated for awards. From this data, it becomes clear that a handful of media conglomerates have a disproportional amount of control over these industries. Check out our accompanying essay Oscars, Inc. for a further exploration of the impact of the Academy Awards on the American media landscape. For the Oscars, all nominees in all categories for the 2015 awards are included except for the short film categories, which don’t receive significant distribution. 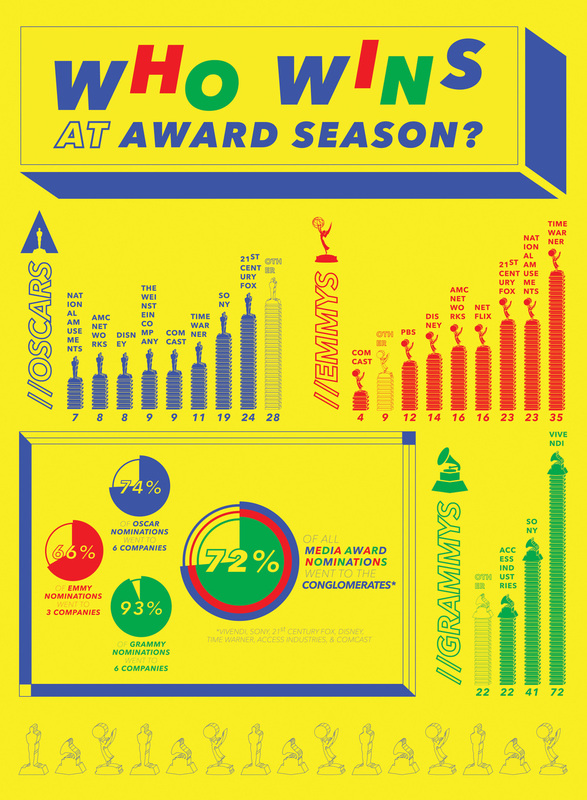 For the 2014 Emmys and 2015 Grammys, due to the sheer number of awards they give, only a portion of the categories were used. For the Grammys, the categories used were Record of the Year, Album of the Year, Song of the Year, Best New Artist, and all awards in the Pop, Dance/Electronica, Contemporary Instrumental, Rock, Alternative, R&B, Rap, and Country categories. For the Emmys, all the awards in the Drama, Comedy, and Miniseries/Movie categories were used. on the American media landscape, see Philip Conklin's accompanying essay entitled Oscars, Inc.